Photographs copyright © 1996 by Jeffrey L. Thomas. he substantial remains of the castle are grouped around a small, open courtyard, with few indications of serious fortification. There is no firm evidence to suggest the site was fortified before 1304, though the substantial foundations of the southwest tower have been compared with earlier defensive stone keeps. Much of what is visible at Weobley today can be attributed to two, probably contiguous, phases of building activity, with work beginning in the early years of the 14th century. Below (2): the modern entrance to the castle is a simple gateway. The earliest buildings to be constructed were the hall block, the two southern towers and sections of the east curtain. 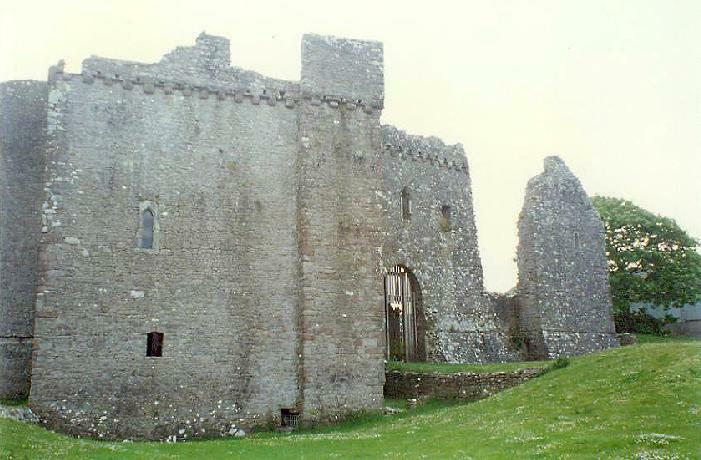 The latter was intended to form the outer walls of the east range. Surprisingly, this scheme made no immediate provision for the defence of the west side of the castle, or the area between the two southern towers. Although this might suggest peaceful conditions during the time of construction, there can be no doubting the defensibility of certain aspects of the work begun during this first phase. This is evidenced, for example, by the crenellated wall-tops, the watchtower and the completion of the southwest tower to battlement level. Below: the porch fronting the north range at Weobley was added about 1500 by Sir Rhys ap Thomas. Before the southeast tower was completed, however, the plans for the castle seem to have been radically altered. A second phase of construction probably continued with little or no break from the first: the total lack of defence on the west and south sides would have been motive enough. 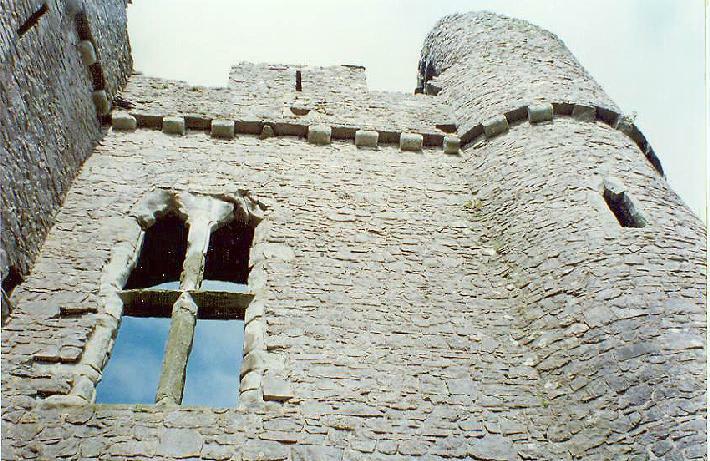 Evidence can be seen in various parts of the castle to indicate the initial scheme had proved too ambitious. 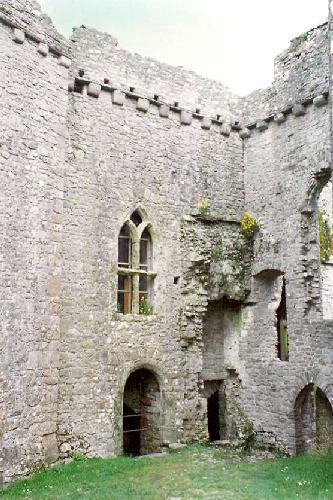 The "toothing" on the outside face of the hall shows, for example, that the original intention was to extend the curtain wall westwards. 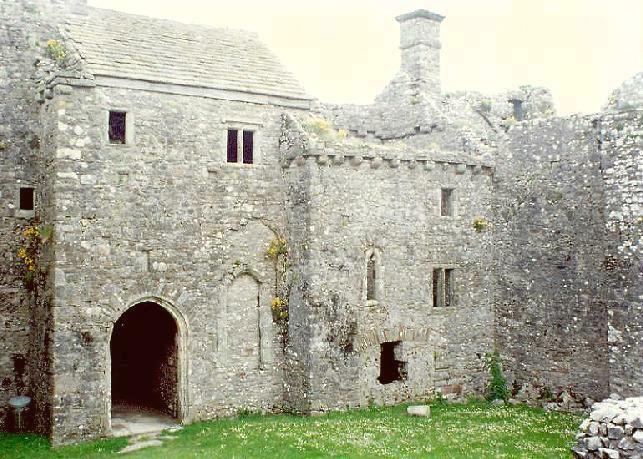 Similarly, in the east curtain wall, "toothing" again suggests that the southern half of the eastern range never rose above ground-floor level. Nor did the southeast tower. Below: A large mullioned and transomed window in the solar at Weobley looked out over the courtyard. We do not know the reasons for the changes in plan, nor can we be certain who implemented them. But it does seem likely that most of the work was done during the tenure of David de la Bere between 1304 and 1327 (when he is last recorded). The work completed during the second phase is notable on two accounts. First, it demonstrates a more economical approach to building, and secondly, the work was less defensible. It is interesting to note that nothing was built which was related to domestic or spiritual needs, perhaps reflecting the changing emphasis of daily life. To complete the enclosure of the site, and to maximize accommodation as economically as possible, three buildings were constructed; the solar block, the simple gateway on the west, and the chapel to the south, together with a short section of the eastern curtain wall. Chambers were also constructed in the now foreshortened east range; the octagonal turret was raised to provide latrines for their upper floors. 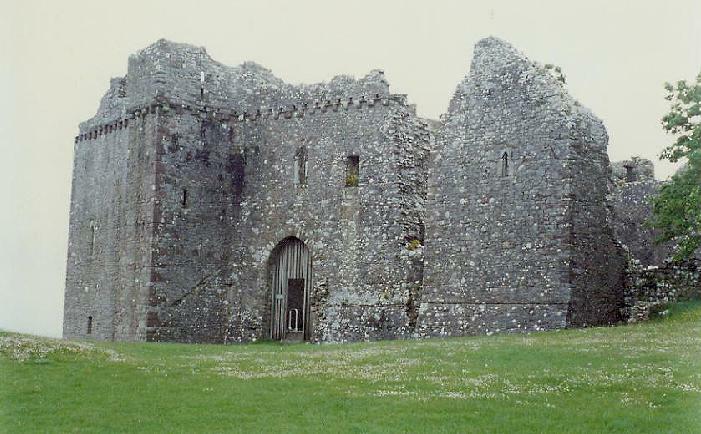 Although various modifications were subsequently made to the 14th-century buildings, there were no significant additions to the castle until the late 15th century. Weobley was then held by Sir Rhys ap Thomas and it is he who added the porch block to provide a more stately entrance to the hall and private quarters. It was this last addition which, in the 16th century was modified for domestic use when the castle had degenerated into a tenant farmhouse. The prominent chimney on the east side of the porch block dates from this period. The solar now houses an exhibition entitled, Weobley: A Gower Castle and the Peninsula through the Ages. It tells the story of Weobley, set against the colorful background of the many ancient historic sites on the Gower Peninsula. 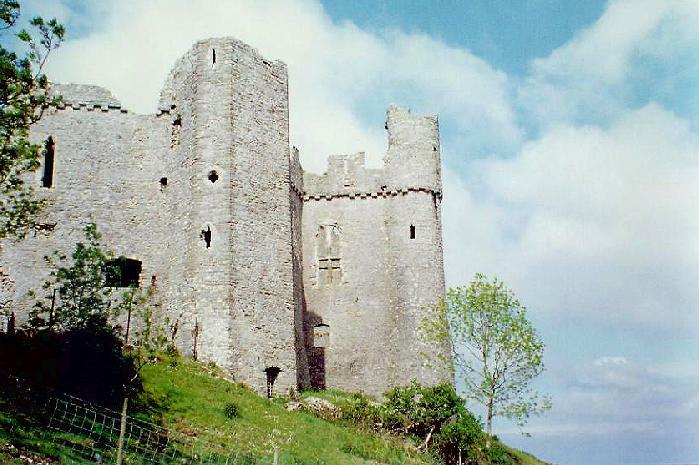 Weobley Castle, Diane M. Williams, Cadw: Welsh Historic Monuments, Cardiff, 1995.